I watched Noah last week with some friends from church. We weren’t expecting A Beautiful Mind, but I would have been happy with Gladiator. I did not get Gladiator. I wasn’t expecting it to be completely true to the biblical account. Which is good, because there were some remarkably true-to-Bible bits (Noah does indeed get drunk and found by his sons in the nud)… but then there were weird magical type bits, too. Like Methuselah making a barren girl fecund, and a snake skin having maybe magical powers? Also, no God. Rusty sometimes implored the clouds, and they talk about the Creator, but God never interacts. I did not expect quite as much angsty Rusty, but I definitely got it; and I really didn’t expect such weird and dramatic hair, and hair changes, as I got. I also didn’t expect the film to be having an identity crisis about whether it was a BC Fantasy film, or a post-apocalyptic SF film. It had occasional moment of both. The creators (heh) kept the basic story… which you’d kinda expect if you want to have even credence as a Noah story. So people have got bad and Noah has a dream (change) wherein he realises humanity will be wiped off the earth via a flood, and he builds an ark to save the animals and a few people – his family – coincidentally. The animals come in two by two (ish), there’s a dove brings notice of land being back, and oh yes, Noah gets drunk afterwards. I guess I understand wanting to add family tension in to the story, but surely there are better ways than this. Even the tired old ‘sisters-in-law not getting along’ would have been better than this – and that’s saying something. Let’s stop and think about the women for a moment. 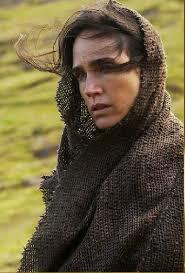 Jennifer Connelly is a great with a rubbish script… although I don’t think her name is ever actually used (apparently she’s Naameh). There is at least one point at which it looks like she’s wearing a very finely woven garment, though, while everyone else is getting around in very natty leathers (Noah appears in what is almost a leather/rags suit towards the end), which is a bit weird and one of those which time period is this? moments. Her character is mostly the supportive-wife type – and since that’s biblically accurate, I suppose (she doesn’t get much airplay there), I guess it’s nice they gave her anything to do. She’s fierce in defence of Ila. And Ila – again, I think Watson does well with a rubbish script. She has quite a lot of agency, for a movie of this sort – she speaks without first being spoken to, she’s noble, she’s fiercely protective of her children and defiant as well. But this is all within the rubbishness of the script. There’s one other named woman, who appears for about five minutes – Na’el, I believe – whom Ham meets when he goes off to find himself a bride. They chat, she seems ok, they head back to the ark… and then she gets trampled to death when her leg is caught in a bear trap (this was another what the hell time period is this set in? moment), and Noah refuses to help. Which is about as bad as it gets for all the unnamed women in the camp of the Evil Mens who are planning to storm the ark when it’s time. Their fate is not explicitly shown, but there’s lots of screaming. There’s a lot else to be said about this film but I’m not sure I have the energy required to take down the ONE HUNDRED AND THIRTY MINUTES in their entirety. The CGI/green screening was… actually some of it was really good – some of the animals were exceptionally lifelike. But overall it just felt so incredibly fake it was difficult to care. Also, they made the ark basically brick shaped. Also also, Anthony Hopkins are you so hard up for cash this was a necessary career choice? Fella, go on Patreon – I’m sure you’ll get lots of supporters and you’ll never need to think about this again. And then there are the Watchers. Who are kind of rock Ents, and kind of Transformers I guess, and kind of that turtle-mountain thing from Neverending Story, and kind of just really really weird. Because they’re fallen angels, see: they fell to earth to help Adam and Eve when they were kicked out of the Garden, and then their fiery essence was encased in rock? Or something? They end up helping Noah because he’s in the direct line of descent from Seth, and because he’s on a mission from God (it HAD to be said). They are, hands down, the WEIRDEST part of the entire film. I will never get back those minutes. I am more glad than I can say that I spent them with friends, and not alone with the film; and it did involve tea and the last of last year’s mince pies, so I guess it wasn’t a complete loss. I guess.